My life became a series of unfortunate events. Now, I want to add to this by saying that this story is not meant to be a sad one. I believe my mother’s death was what I chose for my life when I entered into this physical plane. Her story is what has inspired me to help others and I hope in sharing this, it brings others some hope or inspiration as well. My mother’s cancer spread quickly. She had to have an abortion, a hysterectomy, and a mastectomy all in one week. Now remember, she was 23. I watched my once vibrant, healthy mother deteriorate. I have almost no memories of her healthy. Her original prognosis was 6 months and lived an additional 6 years. From this point on I was taken out of school almost on a monthly basis and rushed to whichever hospital she was at being prepared for her death. My childhood was spent waiting and being prepared for death at any moment. I became very familiar with Swedish hospital and spent many afternoons there finishing my schoolwork while my mother rest in her bed. Sometimes she could play and communicate, sometimes not so much. I remember one day she asked me for a hug. As I bent towards the bed and tried to hug her frail frame, she burst out crying. “Why won’t you hug me?” She cried. I was afraid of breaking her. My mother was a fierce fighter. When she died, we scattered her ashes in the ocean at Cannon Beach, OR. It was ten years before I made it back for a visit. I took a road trip with a girlfriend and made a basket full of origami cranes to place in the water. We used to make origami together during the days when she was well enough to be home. When we scattered her ashes, we placed a crane in the water from each one of the attendees of her party. (My mom had a end of life party complete with a jukebox that played only KC and the Sunshine band and a ton of wine drinking dancing ladies). Setting foot on the beach again was weird. I thought I would feel more than I did, but instead it felt just like any other time on the beach. No intense emotional rush, just a cloudy day in Oregon. I saw my girlfriend across the beach running and waving her arms at me wildly. I couldn’t hear her, but as I took another look around me I realized that I was about to be swallowed up by a huge rogue wave! It came crashing down over my head and as I ran for shore, I tossed up my cranes and a few flowers I had picked and I realized tears were rolling down my cheeks and I was laughing. I started to jump and spin around laughing and crying, my entire body drenched with water. That was the biggest hug I have ever gotten in my life! My girlfriend and I spent the next few hours drinking wine, frolicking in the water and telling funny stories. It was beautiful. 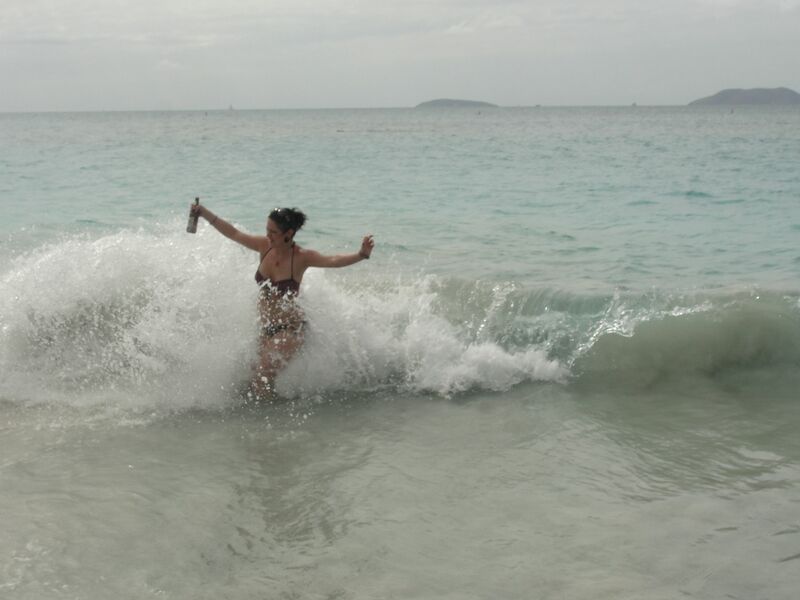 I visited the Virgin Islands about two years ago and I realized that my mom is in every body of water. All the oceans are connected and as we stepped out on Cinnamon Beach at St. Johns, I was excited to frolic in the water and play with my mom. I splashed about and laughed and had a great time. A girl about my age that was in our group saw me talking and laughing out in the water by myself. She turned to my partner and said, “well she’s certainly having a grand time out there all by herself.” That’s when he shared my story with her. As it turned out, her mother had just passed. Her mother’s wish was to be cremated and scattered in the ocean. Her daughter was holding up the wish because she was saddened by the idea that there would be no grave or place for her to visit to see her once her ashes were spread. My story changed her mind and after her visit to the island was over, she was going to go back to her family and let them know they could proceed. A beautiful moment in synchronicity. Today, because I can’t just hop out and visit the ocean anytime, I’m writing this to say hello again and remember. Stress is an illusion and worry is a virus best to be avoided.